After a few days of limited Internet connectivity, we're back up and running (for now). Today we're in the village of Pheriche, and will be here for another day. 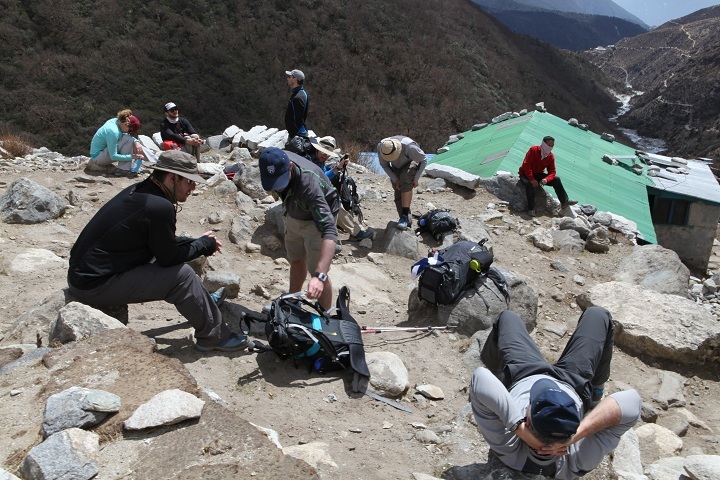 We'll take a short trek to help in the acclimatization as we continue to push higher. Currently we're at about 14,000 feet. Today will also be a day for running the entire team through the full battery of tests before we arrive at base camp. The weather took a definite change yesterday as well trekked from Pangboche to Pheriche, almost everyone has the down jackets and hats on. I'm not sure what the temperature was overnight, but there was frost on the ground when we got up this morning. Yesterday was pretty interesting with a visit to the Lama Geshe in Pangboche. He blessed each of us with hopes for a safe and successful trip. This was all on the same day that that Dalai Lama was in Rochester, visiting Mayo Clinic. As a whole the team is fairing pretty well physically. A few are dealing with some minor GI and possibly altitude issues, but we're all pushing forward.